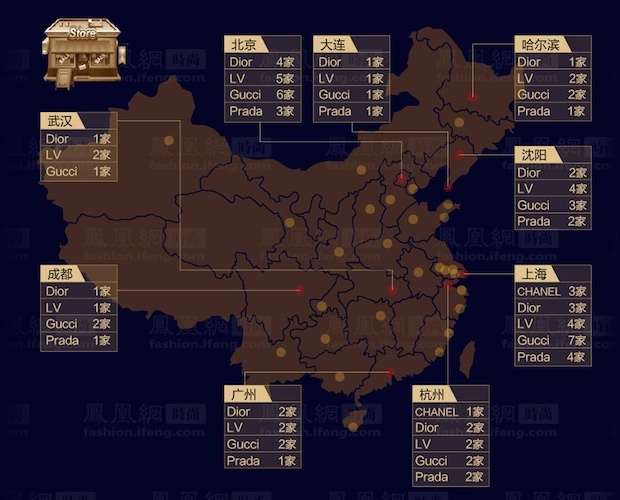 On the heels of Bain & Company’s October global luxury goods report stating that China’s luxury growth has slowed to 2.5 percent in 2013, the consultancy has released a study outlining the slowdown’s major causes and impacts, as well as advice for what brands can do about it. The study found, as Jing Daily has previously noted, that the government’s ongoing corruption crackdown is only one factor in China’s luxury slowdown: changing consumer tastes and shifting purchase channels also play a major part. The report confirms Jing Daily’s previous assertion that the crackdown has also not had a uniform effect on the industry, taking its toll on more heavily gifted items such as luxury watches, which saw an 11 percent decline in sales over the past year. The major bright spots in the market was womenswear, which grew by an estimated 10 percent this year, and shoes, which showed “strong momentum” with an estimated 8 percent growth. Cosmetics, which make up one-fourth of luxury goods sold on the mainland, also logged 10 percent growth; however, this number isn’t as much of a bright spot considering the fact that the number is down from 15 percent last year. Changing consumer tastes are also a major factor in the slowdown, finds the report. It states that in tier 1 cities, “as Chinese shoppers become more sophisticated, they realize that the only way to show their uniqueness and personality is through fashion with personalized mix and match, not with accessories that everybody can wear.” These changing tastes are also leading to a differentiation between tier 1 and lower-tier cities, as second- and third-tier locations have more “traditional” shoppers, according to Bain. Meanwhile, shopping abroad and through parallel daigou channels—services where others purchase luxury goods abroad and sell through professional agencies or Taobao—have had a major effect on the slowdown this year as tariffs remain high and more Chinese tourists are traveling internationally. While one third of all luxury goods sold Chinese customers are purchased outside of the mainland and Hong Kong, the study finds that nearly 60 percent of China’s luxury consumers have used a daigou channel to buy goods, and half of those who haven’t would consider doing so in the future. There have been several effects of this changing luxury landscape. First, store expansion in mainland China “is no longer enough to drive growth,” says the report. It notes that of 20 luxury brands studied, the number of store openings this year declined to 100, compared to about 150 last year. Brands have been shifting their focus to store renovation, relocation, and operational improvement. In addition, luxury consumers are “extremely well informed” about their purchases now. The study found that 73 percent use the internet, including company websites, news, microblogs, mobile apps, and more to obtain information before they buy.